Every Monday evening in summer going back 7 years, we have ran a paddling race originating from the Ballard Elks Lodge in Seattle. Courses vary weekly due to conditions and are usually 1.5 to 2.5 miles long. 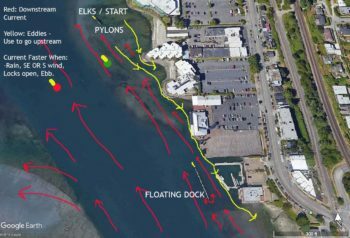 This summer we handed the race over the Ballard Elks Paddling Club (BEPC). 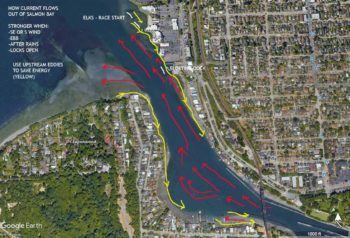 It was decided that the race this summer would start facing south and run towards Ray’s Boathouse and the Ballard Locks, then angle in whatever direction decided for each week’s race route. The Ballard Locks is a dam, so like most dams water is released and there’s current flowing downstream. With the above start, racers paddle upstream towards the Locks. In doing so, there’s an easy way and a harder way. Like most rivers, the sides or shore are where eddies form behind obstructions like buildings, docks, pilings or other obstructions. An eddy is back current that flows upstream or is ‘still water’ meaning there’s no current. Interestingly, most racers don’t know about these two types of water when they paddle upstream. I’ve noticed racers tend to follow the fastest paddler in a clump not realizing the fastest paddler has a plan and is trying to beat the others. During our race starts, the clump has been paddling directly upstream against sometimes 2-3 knots of current. Whereas the eddy, only 10 feet to the left offers no current and a much easier path towards the first turn-a-round buoy or dock. As a less strong paddler than our racer leaders, I’ve been using the eddy and holding nearly equal or slightly behind their progress by using the eddies. Once we reach waters where there’s no eddy, I lose ground considerably (need to hit gym more). Using the photos below, the yellow represents the eddies or the easier way upstream. The red is the opposing current flowing downstream. After rains or in the Spring when mountain snowmelt is flowing out from the lakes. On a South or SE wind. When the Locks open their downstream gates. The Monday race series ends mid September. The Elks may have intermittent Saturday races throughout the Fall and Winter. And the annual Halloween Race. Tip for Rounding Buoys in Current – Take it wide. Racers tend to turn in a clump right at the buoy and current often pushes them into the buoy making it a messy turn. Go slightly wide to compensate for the current push. Follow the yellow paths to avoid paddling against or ‘bucking’ downstream current. Close-up of Elks race start and floating buoy turn-a-round. Use the yellow path to avoid direct current.